I’m a beautiful 4 month old cross-breed with an amazing temperament. 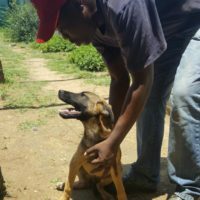 I am so happy to be around people and just love being here at 4Paws but it would be awesome if someone who is a big fan of the Africanis breeds would give me a home. I promise to be a good dog and will love you forever. Please contact Tammy if you can offer me a home or fill in the form below.